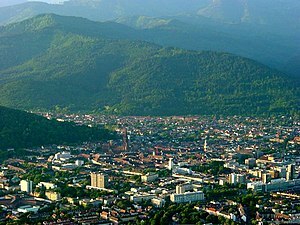 ‘S e baile mòr air an àirde an iar-dheas na Gearmailte a th’ ann am Freiburg im Breisgau. Tha an t-ainm a’ ciallachadh Daingneach Saor, bho dhà fhacal anns a’ Ghearmailtis Frei (Saor) agus Burg (Daingneach). Chaidh am baile a stèidheachadh ann a 1120 le Konrad Zähringen. Tha e suidhichte aig 347m os cionn ìre na mara, ri taobh na h-aibhne Dreisam, faisg air na crìochan leis An Fhraing, anns an stàit Baden-Württemberg. Tha am baile 638km air falbh bho Bherlin (Prìomh-bhaile na dùthcha), 277km bho Mhünchen, 130km bho Stuttgart agus 116km bho Phforzheim. Tha 224,191 duine a' fuireach anns a’ bhaile, leis gur e 4mh baile na stàite, an 34mh baile as motha na dùthcha. Chaidh oilthigh a stèidheachadh an seo ann an 1457. Chaochail Martin Heidegger an seo ann an 1976. Julius Bissier (1893 – 1965) Dealbhadair. Edith Picht-Axenfeld (1914 – 2001) Ceòladair. Karl von Rotteck (1775 – 1840) Seanaiche. Joseph Wirth (1879 – 1956) Ceann-suidhe na Gearmailt 1921 – 1922. Air a tharraing à "https://gd.wikipedia.org/w/index.php?title=Freiburg_im_Breisgau&oldid=543750"
Chaidh an duilleag seo a dheasachadh 25 dhen t-Sultain 2018 aig 17:35 turas mu dheireadh.